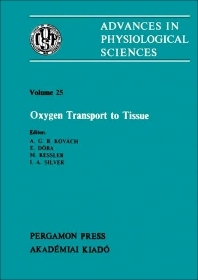 Advances in Physiological Sciences, Volume 25: Oxygen Transport to Tissue covers the proceedings of the satellite symposium of the 28th International Congress of Physiological Science, held in Budapest, Hungary in 1980. This book mainly focuses on the relation of oxygen transport and delivery to heterogeneities, autoregulation of blood flow, organ function, and rheology. This compilation is divided into five sessions. The first two sessions encompass the models and experiments on the relationship between oxygen transport and heterogeneities. The subsequent session presents papers concerned with autoregulation of blood flow and oxygen delivery. The last two sessions are devoted to presenting papers on oxygen transport and organ function and rheology and oxygen transport. This compendium will be invaluable to those studying oxygen transport and its relationship with other biological processes.